A Share Subscription Agreement is a legal document that records the purchase of new shares directly from a corporation, and outlines the exact nature and number of the shares, and the amount to be paid for them. 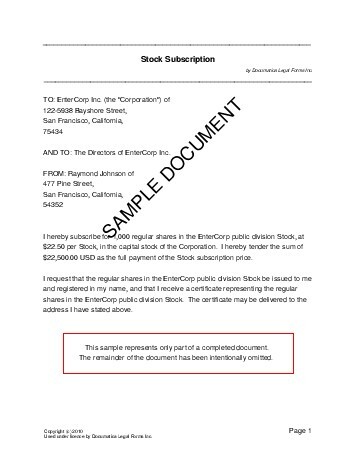 The document also states that the shares should be registered to the buyer, and a certificate should be issued accordingly. This document is retained in the corporation for its records. We strongly recommend obtaining an attorney reviewed Share Subscription directly from us.